A Harvard-educated fact-checker for the New Yorker is being excoriated by the Immigration and Customs Enforcement agency for “baselessly slandering” a Marine veteran — by falsely accusing him of having a Nazi tattoo, according to reports. Officials with ICE are now demanding that the New Yorker and Talia Lavin apologize over her erroneous tweet about Justin Gaertner. In the gaffe, Lavin allegedly implied over the weekend that Gaertner, a combat-wounded veteran and ICE forensics analyst, had the Nazis’ Iron Cross inked on his elbow. But she deleted her post after “military veterans responded that the tattoo looked more like a Maltese cross, a symbol associated with firefighters,” ICE said in a statement. The tattoo, according to Gaertner, is actually a “Titan 2” symbol for his platoon when he served in Afghanistan. 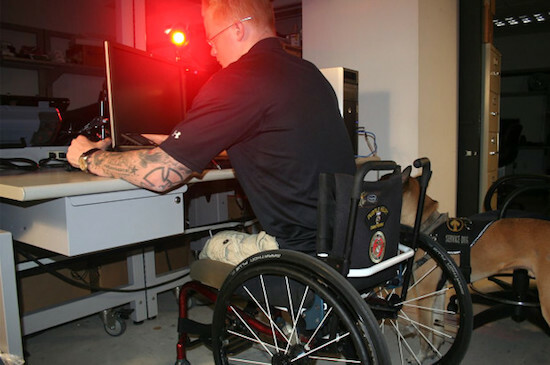 Gaertner lost both of his legs and suffered other permanent injuries when an IED exploded during his deployment to Helmand Province, Afghanistan. He served as a fire team leader and lead sweeper for IEDs. Now Gaertner is a para-Olympic athlete who has “volunteered his time to motivate other wounded warriors and Boston bombing victims,” according to ICE. With the immigration agency, he helps solve criminal cases related to sexually abused children. An obvious question is, what on God’s green Earth would cause anyone to think that the vaguely cross-like symbol on Gaertner’s elbow is a Nazi or white supremacist sign? Only a person far gone in hatred for ICE employees would leap to such an irrational conclusion. Part of the story, I think, is that the Left is hard up for white supremacists. Liberals talk about them all the time, but to the best of my knowledge, I have never met one. Have you? Liberals need to come up with someone other than Richard Spencer; hence the eagerness to libel a heroic ICE employee. This incident might not be worth noting, except that Ms. Lavin is not just a goofy Twitter flake. A Harvard graduate, she was a Fulbright scholar and writes for the Forward as well as, on occasion, the New Yorker. And her writings in other venues suggest that her smearing of ICE agent Justin Gaertner was no fluke. In 2018, the question is not “Who goes Nazi?” but rather “Who goes Trump?” While Trump is far from Hitler and his supporters are a far cry from Nazis, it is undeniable at this point that his is a regime ruled by cruelty and evil. These are more or less insane ravings, but they are typical of what liberals are saying to one another nowadays. Smearing double amputee veterans with false imputations of Nazi sympathies? For today’s liberals, it is all in a day’s work. ONE MORE THING: I didn’t comment on the irony of a New Yorker fact checker making such an absurd mistake on her own facts. I’m so old, I can remember when the New Yorker was justly famed for its fact checking. Unfortunately, in the era of Jane Mayer those days are long gone. The New Yorker is now just another left-wing rag with no standards.